This is one of the cards my Club ladies did yesterday afternoon. Simple & quick!! Card base is Bashful Blue. Background is the Delicate Dots DSP that you can earn FREE during Sale-A-Bration. GET YOUR ORDERS IN NOW!!! Time is running out!!! Order Here!! Click on the card above to see if it will enlarge. We used a Texture plate in the Big Shot on the DSP to give it small raised dots. Love texture!! 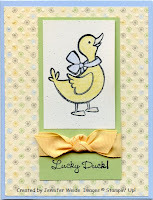 The duck is stamped on Naturals White CS and colored with Watercolor Crayons and either a blender pen or aquapainter. Certainly Celery is layered behind the duck, with the So Saffron grosgrain tied around. The ribbon is also FREE during SAB. The duck is from the Wagon Full of Fun set that is one from the upcoming Occasions Mini that YOU can order NOW!!! Click HERE to see the sets available NOW to get you ready for Easter & Spring!! I will be back tomorrow with more things to share! I got a project off my "to do" list today, so tomorrow I hope to catch up on posting here!! After work of course. Thanks for stopping by and let me know if I can help with anything! !